Birthplace : West Hills, Long Island, N.Y.
Whitman's aim was to transcend traditional epics, to eschew normal aesthetic form, and yet by reflecting American society to enable the poet and his readers to realize themselves and the nature of their American experience. He has continued to hold the attention of very different generations because he offered the welcome conviction that “the crowning growth of the United States” was to be spiritual and heroic and because he was able to uncompromisingly express his own personality in poetic form. Modern readers can still share his preoccupation with the problem of preserving the individual's integrity amid the pressures of mass civilization. Scholars in the 20th century, however, find his social thought less important than his artistry. T.S. Eliot said, “When Whitman speaks of the lilacs or the mockingbird his theories and beliefs drop away like a needless pretext.” Whitman invigorated language; he could be strong yet sentimental; and he possessed scope and inventiveness. He portrayed the relationships of man's body and soul and the universe in a new way, often emancipating poetry from contemporary conventions. He had sufficient universality to be considered one of the greatest American poets. 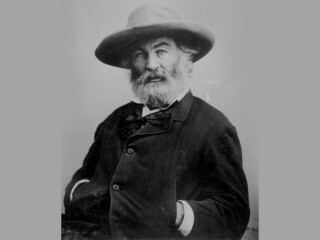 View the full website biography of Walt Whitman.